Filling your house with beautiful artwork is one way to make it feel more like a home. Personally, I like to fill mine with authentic artwork made by my favorite artist–my son. I wanted a project that was both fun for him to create and perfect to display in my house so I picked up a canvas, washable paint, and some swim diapers (he was almost 2 years old when we created this project; with older kids you can use a swim suit.) We were ready for our Toddler Outdoor Canvas Painting Project! The painting my son created looks like an abstract you could buy in a store! Instead of paying a ton of money for a copy of some random artist’s work, this project provided us with a canvas that captured my toddler’s raw creativity, personality, and emotion. It cost us only a few dollars and has lasting sentimental value. I am proud to display this in my home and it gets a lot of praise and attention from visitors. A hose, sprinkler, kiddie pool, etc. 1. There is really no need to lay out a tarp or anything as these paints are non-toxic and washable, so simply lay your canvas out on the grass. 2. Open up every paint color, lay out the painting utensils, and let your child get creative. Yes, they will get messy, but that’s the fun of it! My son used a little of the brushes, a lot of his feet, and even some of his backside to mix colors, splatter them, and draw on designs. He added in a little bit of grass for some texture. *Be careful though! Do not let your toddler paint unsupervised; he/she could slip if walking on the painting and should not ingest the paint even though it is non-toxic. 3. Let your child paint and explore until he says he is finished. An artist needs time to complete his work! For some kids this may not be long but for others you may enjoy a lot of fun time in the sun. 4. Don’t forget to take LOTS of pictures as your little painter works! 5. When your child’s amazing art is complete, let it dry completely in the sun and if there is a chance of rain, stick it inside somewhere that is dry, not humid, where it will be safe from the rain and anything else that could harm it. The drying process can take days if a lot of paint was used, so keep that in mind. You will want the piece to be completely dry before moving onto mounting. 6. With the artwork in a safe place, bring out the hose and let your child play in the water to wash off the paint. Set up the sprinkler, set up a kiddie pool, hop in yourself! This is the great thing about washable paint–it comes right off. Your child just had the BEST DAY EVER turning the canvas (and himself) into a work of art and now he can PLAY to get cleaned up! 7. Once the paint on the canvas is entirely (and I mean completely dry), turn the painting over, find the center, and attach a mounting bracket to the top piece of wooden frame so it can hang on the wall. 8. Don’t forget to let your little artist sign the piece! I had my son “sign” on the back of the canvas then I added his name and the date it was created. 9. Display your child’s creation for everyone to see! I have another great idea for canvas painting with kids and it was a huge hit! Watch for this post in the coming months as we get closer to Christmas! 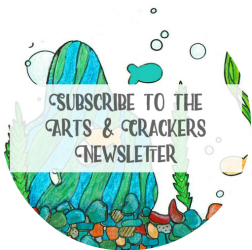 Subscribe to my blog and/or follow Arts & Crackers on social media to stay up-to-date! -Where will you hang your custom art? art, canvas, decorating, DIY, kids, outdoor, painting, sensory, toddler. Bookmark. It was a lot of fun!! It’s like finger painting with your whole body lol. So fun! We painted rocks the other day outside. A canvas would be fun too! I’ll have to put it on the ‘to-do’ list since he loves painting so much! Visiting from the Wine Down Wednesday Link Party! That sounds like fun; my son loves rocks! Popping by from the link up! My daughter would absolutely love this fun craft time experience!! Plus it would be perfect artwork for the playroom!!! Thanks for sharing! Consider me your newest follower! Welcome Amanda! Thank you! Yes my son had soo much fun with it. Seriously, I think it made his whole year haha. There are so many great diys on here. This one would be so memorable to do with my youngest nephew. Thank you, DJ! We had a blast with this. My youngest is around the same age now and we are going to do one with him before it gets too chilly outside. Pingback: 21 Easy Nature Crafts for Kids - Look! We're Learning!